They say don't judge a book by its cover... but boy oh boy, pretty much everything you need to know about this book is right there on the front. From the name, to the picture of good times by the sea, to the declaration that it is NOT just about surfing. This book is as jam-packed with things to do as the cover suggests. 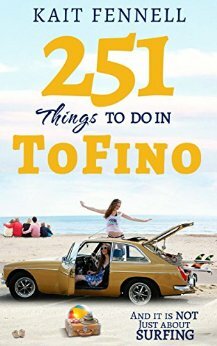 For the traveller that finds their way to Tofino, out on Vancouver Island in British Columbia, this is pretty much an essential guide. Entertainment, hikes, places to explore and much, much more, this book is brimful of ideas. It's the sort of book that you want every hotel to have an equivalent of whenever you get to your destination of choice. Beyond the lists, there's a lot of personal testimonies from residents in the area too, giving a real feel of the place, and what it means to local people, as well as visitors. More than that, it's all related with a boundless enthusiasm that really makes you want to go and walk those trails, try out those bars and maybe, just maybe, try a little bit of that surfing too. If you're headed for Tofino, you need this book.